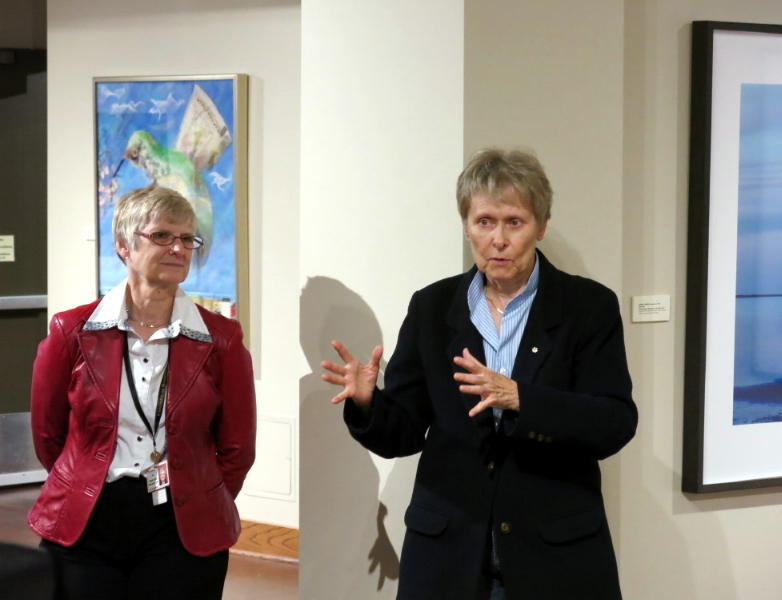 The Roberta Bondar Foundation welcomes new opportunities to explore the fusion of art in science and the science in art. 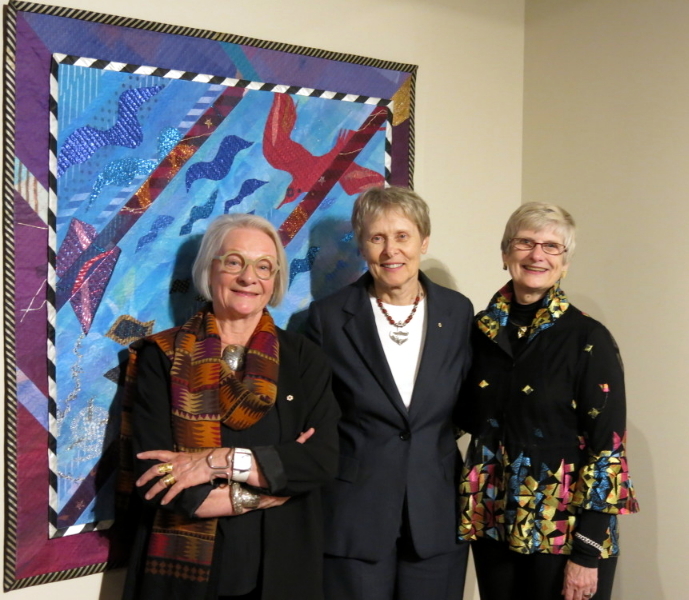 The Foundation shares some of its images with other artists to create new ways of realizing that fusion. 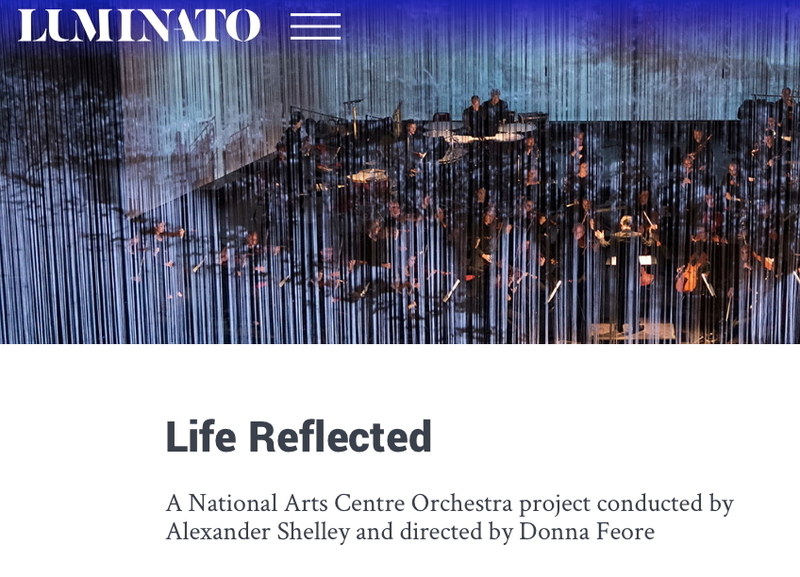 Sunday, June 18: Luminato 2017 presents the National Arts Centre Orchestra’s celebrated Life Reflected — storytelling, original compositions, and immersive multimeda to reflect four legendary Canadian women: anti-bullying advocate Amanda Todd (My Name is Amanda Todd), writer Alice Munro (Dear Life), astronaut Roberta Bondar (Bondarsphere) and poet Rita Joe (I Lost My Talk). The concert was presented in collaboration with The Roberta Bondar Foundation. 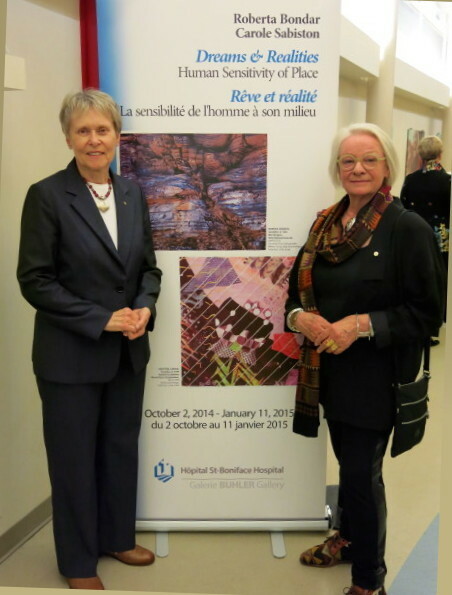 Dr. Bondar was the concert’s special guest. 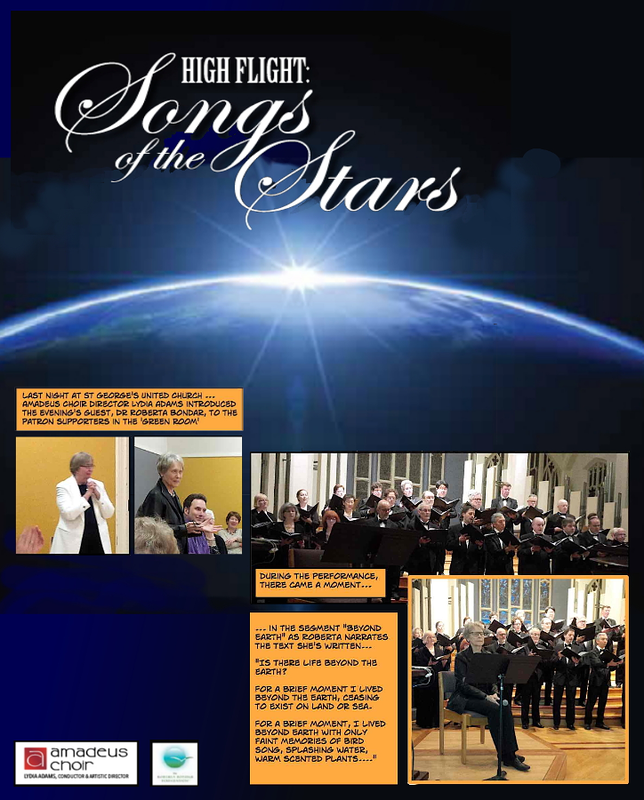 Along with Bondar’s captivating photography, were choral works inspired by the magic of the heavens and the earth, as well as real star sounds. 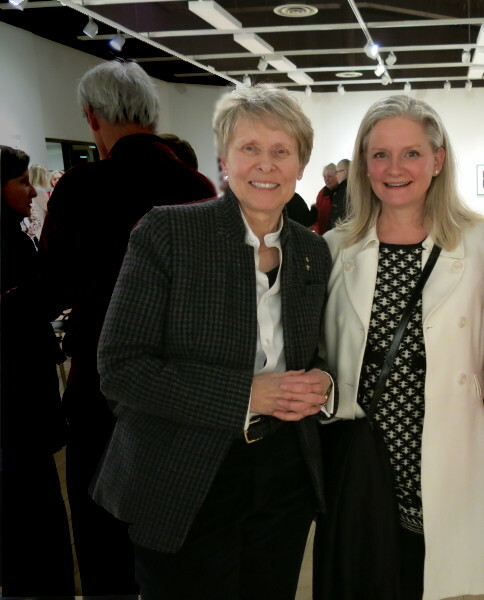 A collection of powerful stories inspired by life experiences of four exceptional Canadian women — Alice Munro, Amanda Todd, Roberta Bondar and Rita Joe. 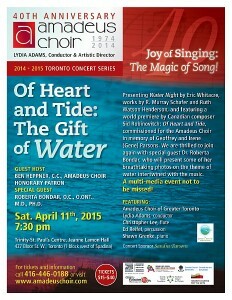 The stories are told in a sensory immersion of multidisciplinary composition — music, film, dance, photography. In 2015, The Foundation joined a second multimedia collaboration with the Amadeus Choir of Greater Toronto in an evening of music and image — Of Heart and Tide: The Gift of Water — under the direction of conductor Lydia Adams. 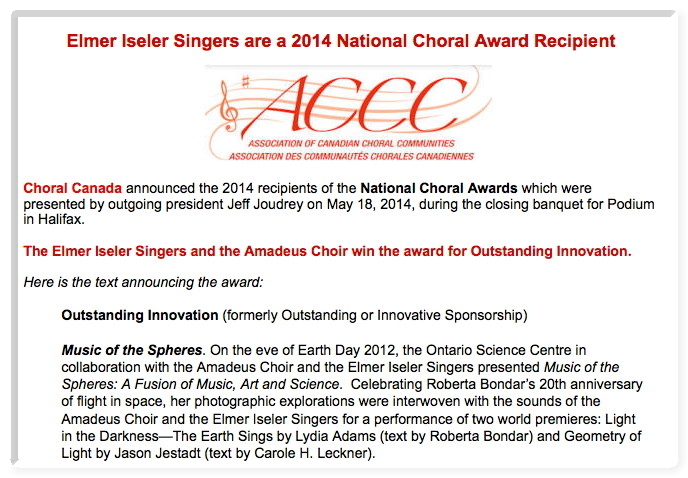 The Association of Canadian Choral Communities awarded “Most Innovative Performance” to the Amadeus Choir and Lydia Adams, conductor for Music of the Spheres. 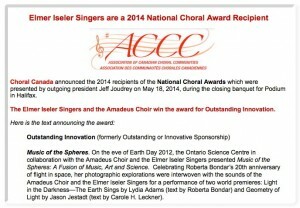 Music of the Spheres is officially an Outstanding Innovation! 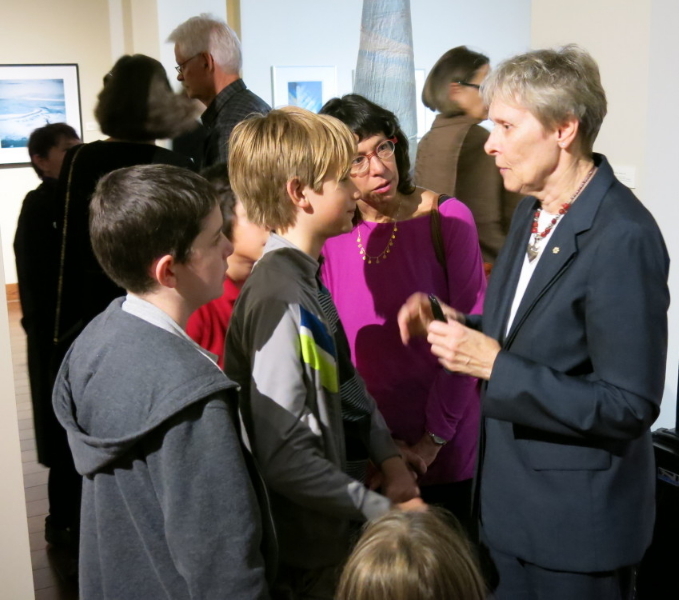 Participant Dr Roberta Bondar talks about how we see elements in Nature differently. 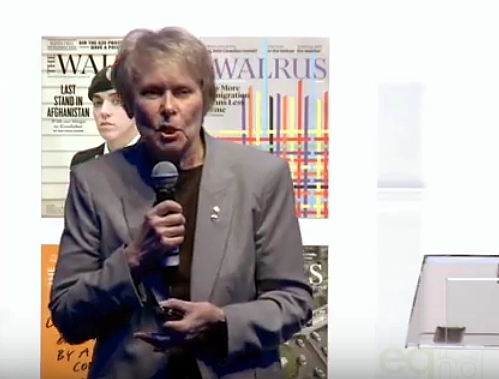 From the Walrus Foundation, host of Autumn 2012’s public conversation at Toronto’s AGO about the future of our cities and the nature of urban living in Canada. 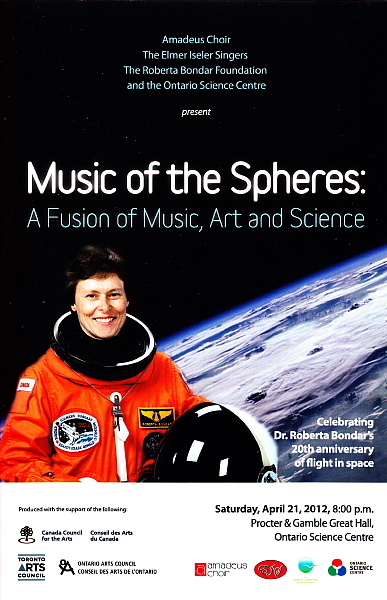 In 2012, The Roberta Bondar Foundation was pleased to collaborate on Music of the Spheres, a multimedia production between the Amadeus Choir, the Elmer Iseler Singers, and The Ontario Science Centre under conductor Lydia Adams.